I admit I was a blatant cynic regarding such training. All throughout the after-hours company class those 14 weeks, my attitude generated spectacular fireworks (aka head-butting) with the local Dale Carnegie franchise owner’s son, one of my instructors. I’ll leave that anecdote where it belongs–quarantined by my blog’s anti-spam plugin. As I age, Mr. Carnegie’s words become more meaningful (and less hokey) to me. 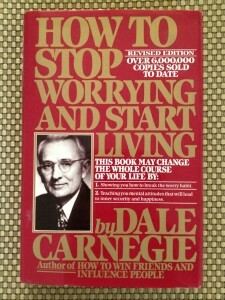 There’s one specific Dale Carnegie book I find more comforting than the rest: How to Stop Worrying and Start Living. Sounds great, but not so easy to accomplish. I say this as a (tempered) Type A who earned a tidy sum in college lending my course notes to other students who seemed much more prepared than I was to start living. “Live in ‘Day-Tight Compartments'” (Don’t Worry, There’s More…): Yep, that was the upfront reveal. I’m sharing it with you in the same spirit that Dale Carnegie shared in it the book; it’s the first chapter of Part One (“Fundamental Facts You Should Know About Worry”). He attributes the original phrase, “…to live with day-tight compartments,” to Sir (and Doctor) William Osler. If you believe you understand these words and are fully equipped to start implementing them, stop reading RIGHT NOW and get to it. “Live in ‘Day-Tight Compartments'” by Planning Without Anxiety: Being focused on today’s tasks, and only today’s tasks, doesn’t mean you should abandon your planning instinct if you live to plan. Dale Carnegie evolved into a joyful man, but he was not was a careless human being. See, Dale realized it wouldn’t be prudent to start or run a business without a plan. Just don’t work yourself into a self-paralyzing stupor about the plan’s next day–take care of TODAY’s piece of that plan. 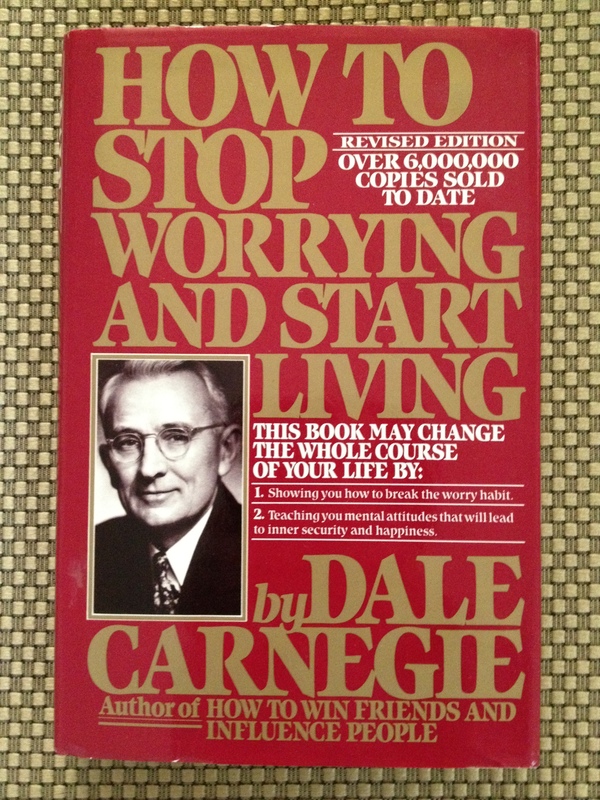 “Live in ‘Day-Tight Compartments'” by Accepting That One Step Is Enough (For You): Another person who found his way into Chapter One of Dale Carnegie’s How to Stop Worrying and Start Living was Arthur (Hays) Sulzberger. From 1935 to 1961, he was the publisher of The New York Times. The man who helped steer journalism’s rudder during World War II was so caged by his own future thoughts that he woke up most nights. He tried painting a self-portrait as a means of banishing his sleeplessness. Instead of letting all the days ahead figuratively glue you into a lifetime of worry, view each day as the one step you’ll take only on that day. “Live in ‘Day-Tight Compartments'” by Treating Your To-Do List Like an Hourglass: Nothing enhances a lesson about circumventing worry like another Dale Carnegie anecdote. In How to Stop Worrying and Start Living, he shares the story of an Army officer in Europe who worried himself into a state of serious physical and mental exhaustion toward the end of World War II. “Live in ‘Day-Tight Compartments'” with Additional Help from Thomas Carlyle: In How to Stop Worrying, Dale Carnegie borrowed and built upon Sir William Osler’s compartmentalized advice. He also revealed the source of Sir William’s wisdom. The man who helped found a sleepy little institution called Johns Hopkins University School of Medicine read one sentence that allegedly put him on a worry-free path for the rest of his life. How do you feel right now at the dawn of your personal and professional 2016? When you first read the phrase “Live in ‘day-tight compartments,'” what visual immediately entered your mind? Is fretfulness an everyday behavior for you? If so, are you now ready to “Let It Go” via Dale Carnegie’s seasoned (but still timely) advice? I wish you all the best TODAY possible! Lori Shapiro is the owner of By All Writes LLC, a business-to-business (B2B) company in Marlton, New Jersey, that plies its trade via copywriting, editing, and other content-development services. She revels in shielding her clients from the torturous, time-consuming pain of writing their own print or web marketing/promotional copy. ← Bodacious Business Horoscopes: Career-Climbing Capricorn! 4 Responses to Start Your New Year with the Best Dale Carnegie Advice Ever! I’ve been overwhelmed for months now with my son’s approaching Bar Mitzvah. This is probably why I entrusted my first blog post of 2016 to Mr. Carnegie’s evergreen advice. I enjoyed this post, Lori. I’m all for getting something good out of corporate-paid training. 😉 What I am most excited to learn, however, is that you worked for GM, as I worked for Ford – although they didn’t have any acronyms for “contract employee of another agency with less expensive benefits and no stock options, unless it might have been Supply Help In Technology. We did have an acronym for the database I worked on, known as the Corporate Technical Information System, or CTIS. The first time I ever googled myself, many many years ago, I came across a research paper which, if I recall correctly, was on how not to run a corporate library. CTIS – and our org chart at the time – was prominently featured. No one offered us any Dale Carnegie training, though. That might have helped. So, you are also a survivor of the automotive industry (the most testosterone-filled “old boys’ club” I ever experienced). We’ll have to “talk shop” one day; Dearborn was always considered enemy territory by my superiors! I didn’t fully immerse myself into the acronym way of life until I transferred to Saturn. See you on the Twinternet, Paula.